Construction has become increasingly complex, with tighter schedules and budgets. Use Autodesk Building Information Modelling (BIM) software on-site and in the office to help streamline workflows, maintain more accurate information and keep BIM construction projects moving forward more predictably. See Autodesk BIM workflows, products and project case studies for the construction industry. Learn from contractors who have experienced the benefits of BIM for construction projects. Autodesk BIM solutions enable workflows that provide decision-making insights and project co-ordination consistency, improving outcomes and client satisfaction. Balfour Beatty improves co-ordination and reduces RFIs to deliver early. BIM collaboration in the field helps Clayco improve productivity. BIM prefab precision and co-ordination speed delivery for Hoar Construction. 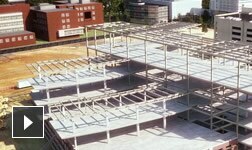 Consigli Construction reduces time, costs and campus disruption with BIM. Turner uses cloud-based BIM collaboration to streamline airport construction. Contractors are innovating with BIM to deliver business value. Autodesk design, simulation, visualisation and collaboration software helps construction teams to get started or expand the power of BIM to minimise waste, increase efficiency and improve quality. Integrated building design software featuring BIM and CAD tools. Cloud-based software for project co-ordination and collaboration. Civil design and construction software. Project review software for construction. Data management software for organising and tracking data.